Theresa Bouley, 61, of Winnie, died Thursday, January 17, 2019, at Christus Hopsital-St. Elizabeth, Beaumont. She was born to Lesie Cloud and Opie Bouley, on March 4, 1957, in Jennings, Louisiana. Survivors include her husband, Toby Marceuax; son, Toby Bouley; daughter, Teela Marceaux; brothers, Jason Bouley; Arnold Bouley; Floyd Bouley; and sister, Eva Bouley. She is preceded in death by her parents; brothers, June and Larmand Bouley; and sister, Yvonne Myers. A Rosary for Mrs. Bouley will be recited at 5:00 p.m., with her gathering to follow until 8:00 p.m., Wednesday, January 23, 2019, at Broussard’s, 134 West Buccaneer Drive, Winnie. A Mass of Christian Burial will be celebrated at 11:00 a.m., Thursday, January 24, 2019, at St. Louis Catholic Church, 315 Buccaneer Drive, Winnie. 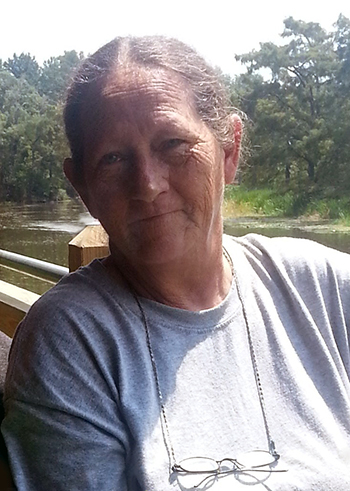 Her graveside service will be 3:00 p.m., at Bon Pasteur Cemetery, Highway 90, Welsh, Louisiana 70591. We were so sorry to hear of Theresa's passing. She was a happy and lovely person. I enjoyed the time we worked together. May God bless the family and have the knowledge that Theresa now walks with the Lord!